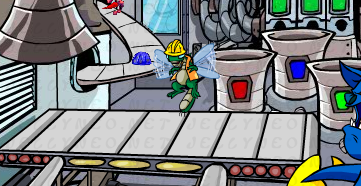 In Hungry Skeith (formerly known as Jelly Processing Plant) you adopt the role of a Buzz who is in charge of removing the less desirable items from a conveyor belt of food being fed to a giant Skeith. It's a nice simple game with equally simple controls that can net you a fair amount of Neopoints and even an avatar for your troubles. Your job is to direct the little Buzz up and down the conveyor belt to pick up the three different items of food that the Skeith doesn't like eating and drop them into the barrel at the back of the screen with the corresponding colour. 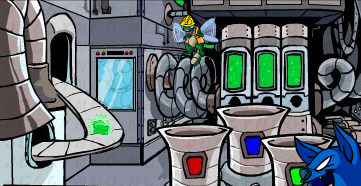 You use the left and right arrow keys to move the Buzz back and forth along the conveyor belt and use the space bar to pick up and drop food items. Use the up and down arrow keys to move the Buzz backwards over the barrels and then bring him back up to the front again. The main problem with this game is that if you actually try to think about which button you want to press at any given time you can end up confusing yourself. So it's worth taking a few minutes just to get used to the system, ignoring the food and just playing around moving about the screen to get yourself comfortable with it. That way once you get into the later levels and the conveyor belt starts to gather speed you can just trust that your fingers know what they need to do without you putting very much conscious thought into it. Although you can't pick up the food here yet, you can drop food onto the conveyor belt to return it to the queue of foods to be dropped onto the main belt leading to the Skeith's mouth. Tapping the down arrow key at any time whilst you're in the background of the playing screen will bring you back to hovering above the front conveyor belt, though you will be at the very end of the belt right in front of the Skeith's mouth. You will begin each level in the same spot where you ended the level before it, so it's a good idea to get into the habit of returning to the front conveyor belt straight away after dumping each food so that you know where you'll be at the beginning of the next level (this may not seem like a big deal during the earlier slower levels but it's quite handy later on when the pace quickens). It can sound a bit confusing when you read the controls out like that but once you physically do it it's much easier to get your head round I promise. When you see one of these on the conveyor belt you have to pick it up and dump it into the barrel with the same coloured square on it to stop the Skeith from eating it. If you miss it and it reaches the end of the belt, where he eats it, then you will lose a life. You also lose a life if you drop the food into the wrong coloured barrel, or if you drop a regular food item into one of the barrels. The rest of the foods you can just leave for the Skeith to eat, although they don't add to your score at all. 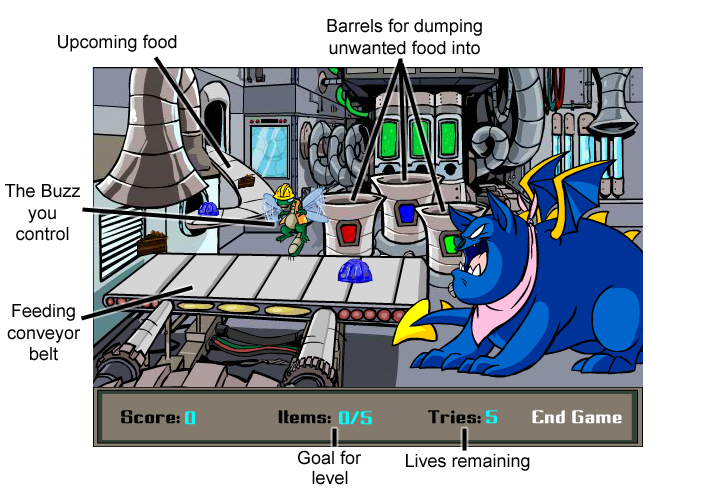 On the first level your goal is to pluck 5 of the 'bad' foods from the conveyor and dump them into the trash, then with each following level the target number of foods increases by five and the conveyor belt speeds up a bit. During the earlier levels when things are going much slower try to avoid dumping any red peppers if you can help it; instead focus on the blue jellies and green pies which give you more points. 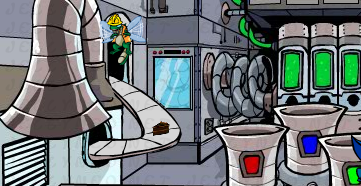 If a red one does appear on the bottom conveyor belt, pick it up and drop it back onto the upcoming foods belt at the back instead. This way you can increase the maximum number of points you can get for the first 2 levels or so (after that it gets a bit trickier to keep on top of it) and although it doesn't seem like that much of an advantage it might make the difference between getting the avatar-worthy score or not later on. If you are aiming for the avatar then technically the earliest you could get the 1001 points necessary would be on level 7 (though that is assuming that you only got green pies, which is extremely unlikely) and the latest would be level 12 (assuming you only got red peppers, again not likely). On average it's usually possible at around level 9 though, or sooner if you're lucky with what foods you get.